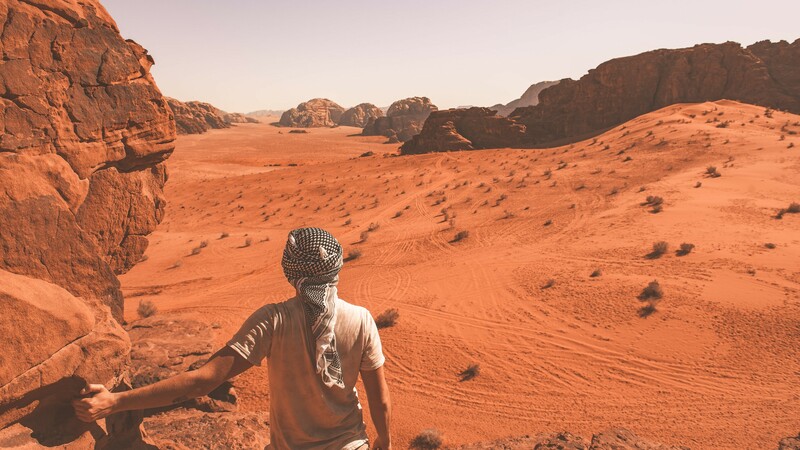 Wadi Rum, a magical and enchanting desert landscape, with its Bedouin camps, sandstone and granite rock formations, breathtaking colors, and captivating beauty is a definite “must-see” when traveling in Jordan. Also referred to as “The Valley of the Moon”, Wadi Rum showcases its marvelous canyons and unique valleys shaped over time from the sand and wind. 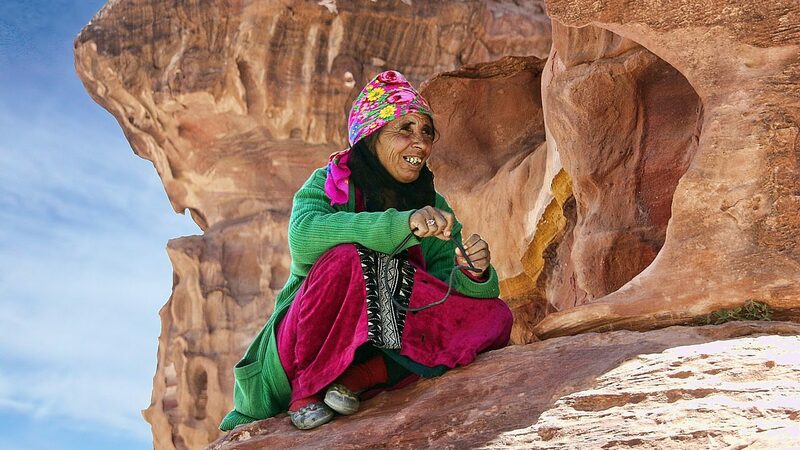 Wadi Rum is appealing for all types of travelers, from trekkers and rock-climbers seeking adventure to travelers looking for a unique and relaxing getaway amid the spectacular desert beauty. Regardless of your travel style, here are some recommendations of the best Bedouin Camps in Wadi Rum. Beautifully situated – and without a doubt one of the best Bedouin Camps in Wadi Rum, Beit Ali Bedouin Camp is the perfect embodiment of Bedouin hospitality and tradition. Surrounded by the stunning desert, Beit Ali camp combines traditional Bedouin tent accommodation as well as upgraded chalet tents. Beit Ali also offers both shared and private bathroom facilities and showers. Complete with a swimming pool, bar facilities, and their own organic farm providing fresh produce, Beit Ali Bedouin Camp creates a well-rounded experience. Friday evenings there’s a “party night” with traditional Jordanian music and dancing. While other evenings can be peaceful and quiet, where the desert offers distance from city sounds and allows you to fully escape and enjoy the tranquility and calm in this environment. Guests can also enjoy Shisha (also known as hookah or water pipe), authentic cuisine prepared in a traditional Zarb (underground oven), fresh coffee and espresso and the perfect site for enjoying both the sunrise and sunset, a unique amphitheater. Beit Ali Bedouin Camp is an excellent example of clean, modern accommodation that maintains its authentic Bedouin essence. 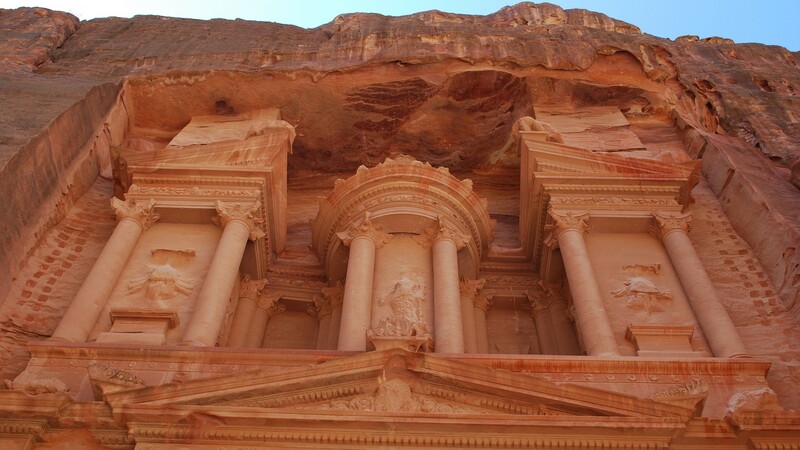 Interested in spending the night at Beit Ali and enjoying a tour through Petra and Wadi Rum? 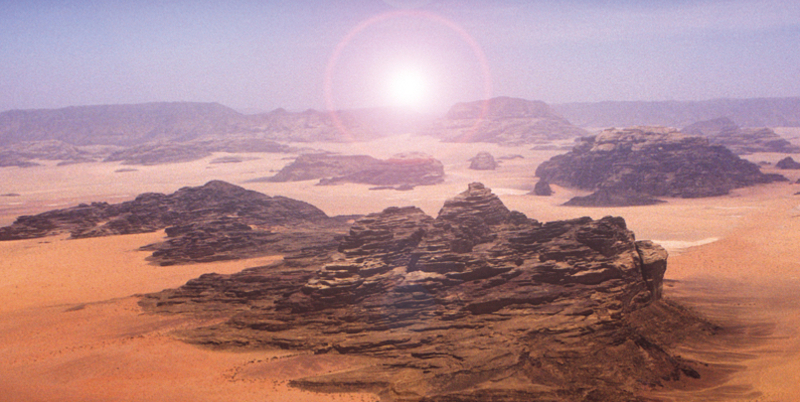 Check out our Wadi Rum Tours, offering daily departures and competitive prices. We highly recommend spending two nights in the desert with our unique Wadi Rum Bedouin Experience Tour. Wadi Rum Full Moon Bedouin Camp, is conveniently situated near the well known Khazali Canyon, and near the Small Rock Bridge, and the Umrashed Mountain. Based on the traditional Bedouin culture, this campsite can accommodate up to 30 guests. Wadi Rum Full Moon Bedouin Camp creates a magical and memorable experience, as it is tucked away and far from any lights, allowing the moonlight to shine through and the desert silence to bring a sense of calmness under the stars. Offering a mix of shared larger Bedouin tents, and options for private sleeping rooms and small separated tents, toilets, and showers and the campsite is situated around a fireplace for communal gatherings and meals. The kitchen is traditional and offers a wide spread of authentic flavors. 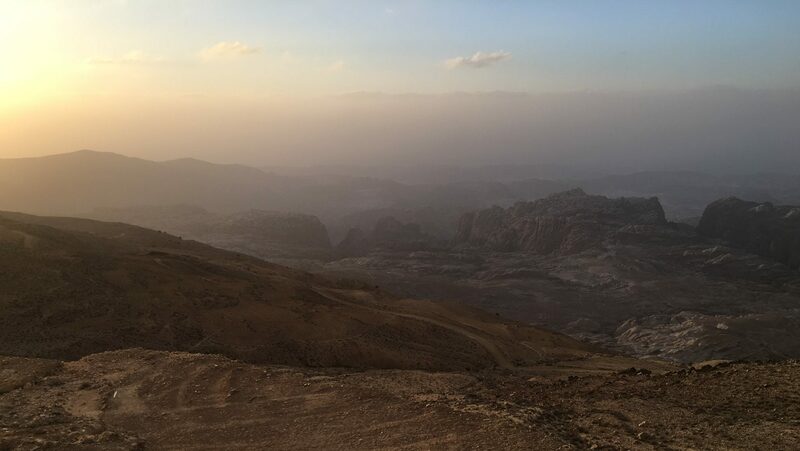 This is the perfect place for a relaxing experience, and an excellent Bedouin Camp in Wadi Rum to be lucky to find a shooting star while stargazing under the night sky. The majestic and spectacular desert surrounds this serene Bedouin camp in Wadi Rum which focuses on the simplicity of Bedouin life. Offering a high standard of accommodation and amenities, Sun City Bedouin Camp offers a range of tents from traditional Bedouin tents which can house 30 guests to Royal Tents which sleep eight guests and Family Suites which offer a private 2 person experience. 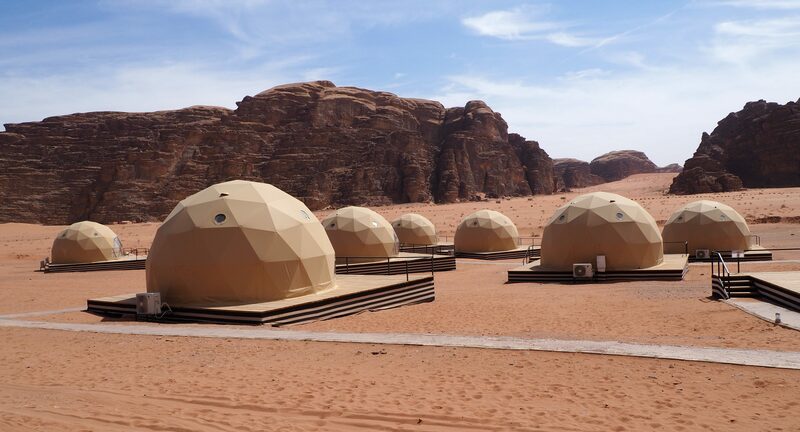 The camp also offers their unique Martian Domes which can be instantly spotted and replicated and reflect the evening sky into the sand in these special domed tents. Sun City Camp also offers guests traditionally cooked meals in a buffet setting. It is one of the best Wadi Rum Bedouin Camps and mixes adventure with relaxation and is happy to accommodate adventure seekers looking for a daring experience in the desert, or those guests looking for some rest and relaxation who can engage in a special yoga class in this tranquil environment in the Wadi Rum desert. For those travelers looking for a luxury experience in the desert, where you can relax in bathrobe and slippers and a king size bed, in the middle of this arid landscape, Wadi Rum Night Bedouin Camp offers luxury tent facilities. This impressive Bedouin camp provides big luxury tents, luxury bathroom and shower options, a delicious restaurant serving authentic delicacies, and a stunning lounge area. This is the perfect place to relax and admire the spectacular view of the surrounding Wadi Rum mountains. If you are looking for the “Glamping” experience, these Bedouin Style tents are outfitted with all handmade furniture, high-quality linens, lamps, mirrors and all the amenities of a hotel room, in a luxurious desert tent. These tents are all powered by the sun, using solar power to create this unique environment. 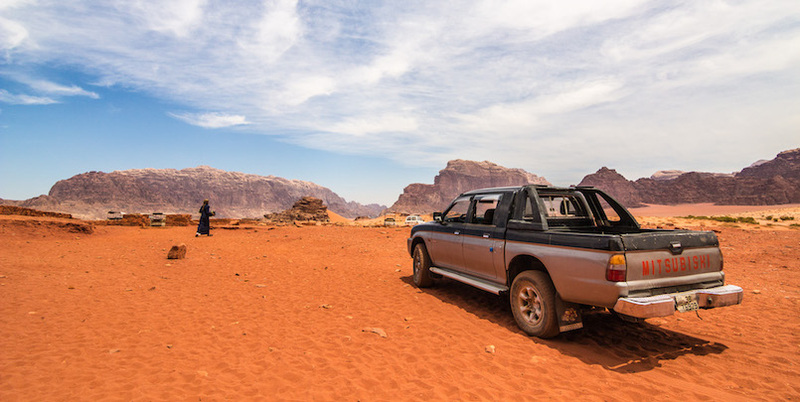 Whether you are interested in a rustic outdoor experience, or a more luxurious “glamping” retreat, the Bedouin Camps in Wadi Rum are wonderfully welcoming and sure to offer a special and memorable visit in the desert. 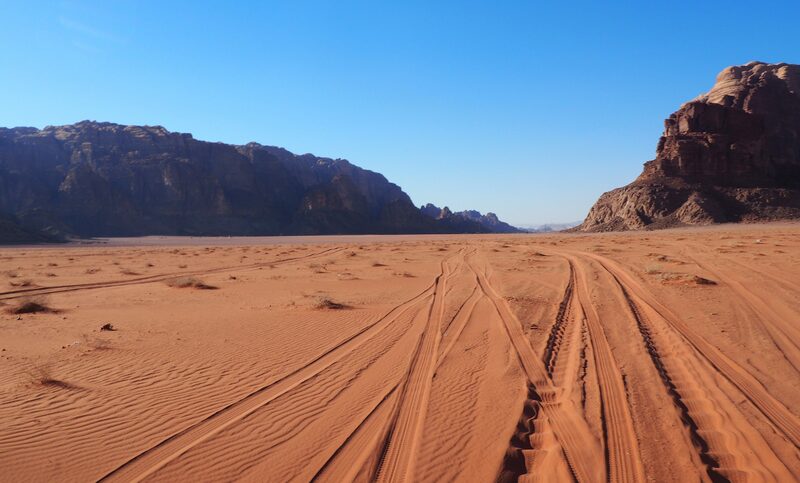 Interested in checking out more exciting options in Wadi Rum? From Jeep Tours to Hiking in the Valley the possibilities are endless in this astounding and dramatic landscape.